NASHVILLE, TN – The Clemson women’s tennis team competed in the June Stewart Invitational on the campus of Vanderbilt University on Friday, Saturday and Sunday. The Tigers’ Ana Stiglic and Richele LeSaldo placed second in the flight four and six singles draws, respectively. Stiglic reached the finals of the flight four singles draw on Sunday via wins over Penn State’s Leigh Ann Merryman, 6-3, 7-5, and Purdue’s Lara Burgarello, 6-1, 6-7(5), 6-4. In the flight championship match, Stiglic fell to Vanderbilt’s Ashley Schellhas, 6-4, 6-4. LeSaldo defeated Shawna Zuccarini of Purdue, 7-6(5), 3-6, 6-3, and Laura McNamara of Middle Tennessee, 7-5, 6-2 en route to the flight six championship match. In the finals, LeSaldo dropped a 6-3, 6-4 decision to Shannon Stough of Kentucky. Ashlea Bowen also competed for the Tigers in the flight six singles draw. Bowen fell to Penn State’s Lindsay Downing by a score of 6-3, 6-3 in the first round, and Marshall’s Holly Asel, 6-2, 6-3 in the consolation semi-final. Bowen was defeated by Georgia Tech’s Maria Nieto in the seventh-place match by a score of 8-3. At flight three singles, the Tigers’ Ioana Paun defeated Melissa Schaub of Tennessee, 6-2, 6-3, in the first round, before falling in the semi-final to #46 Catherine Gunn of Georgia Tech, 6-7(5), 7-5, 6-2. 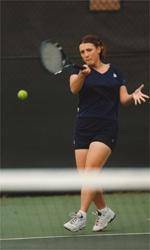 In Sunday’s third-place match, Paun lost a 6-2, 6-3 decision to Jill Buckley of Kentucky. Anna Dolinska of Clemson lost a 7-5, 7-5 decision to Purdue’s Missy Wright in the first round of the flight five singles draw, before defeating Georgia Tech’s Sekita Grant by a score of 7-6(7), 6-2. In the match for fifth place, Dolinska fell to Judy Wang of Penn State by a score of 6-3, 6-2. The Tigers’ Sunnie Harmon defeated Purdue’s Catie McLevish by a score of 6-4, 6-2 and fell to Penn State’s April Uy by a score of 7-5, 6-1 in the round robin flight seven singles draw. Harmon won her final two matches by default over MTSU’s Emily Vest and Kentucky’s Danielle Petrisko. In doubles action, Clemson’s number two team of Dolinska and Paun won their first round match over Kentucky’s Anson and Stafford by a score of 9-8(4), before falling to Purdue’s Iqbal and Woods in the semi-final, 8-6. The pair dropped the third-place match to Merryman and Husain of Penn State by a score of 8-2. At flight three doubles, the Tigers’ duo of LeSaldo and Stiglic fell in the first round to Georgia Tech’s Schenek and Grant, 8-3. The team then won their next two matches over Tennessee’s Cohn and Farace, 8-4, and Georgia Tech’s Nieto and Gunn, 8-3, to claim fifth place in the flight three doubles draw. In the round robin flight four doubles draw, Clemson’s Bowen and Harmon dropped their match to Stough and McNamara of Middle Tennessee by a score of 8-3. Julie Coin, Laurence Jayet and Paun will compete for the Tigers in the Omni ITA Southeast Regional on Oct. 24-28 in Winston-Salem, NC. The entire team will return to action on Nov. 1-3 in the South Carolina Invitational in Columbia, SC.